Buses to work have been mostly OK recently – I’ve either become accustomed to the noise and the jouncing or my luck in catching quieter, gentler buses has improved. However, one ride earlier in the week was particularly bouncy. When it neared the stop I wanted to get off at, the driver hesitated for a long moment at a zebra crossing, apparently asking me and another passenger if where we wanted to get off – as if the fact that we’d rung the bell and stood up wasn’t enough. As soon as I got off the bus, I tripped on the uneven pavement, fell on my hands and rolled on to my back. In frustration, I kicked the bus shelter – pretty hard. Too hard, really, as my right big toe hurt pretty badly. I limped off, down the steps to the river, but I had to stop and rest a moment. I took of my shoe and sock and held some snow to my toe. It was already quite purple in the nail and the skin around it. When I eventually continued, I realised I didn’t have my travel mug and had to go back to the bus stop to where it was lying on the ground. At the end of the day, much of my right foot was swollen. The toe itself, several days later, is still swollen and still hurts. The sensations reminds me of my wart treatment from a few years ago. I haven’t seen a doctor about it. There’s no structural damage – it flexes readily and painlessly. But the nail is pink and it’s surrounded by some bruising. 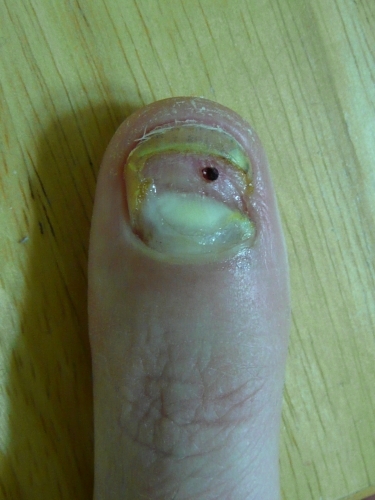 I’m a little worried that the horror of my thumb might be repeated, but the bruising is not that intense – the nail is lilac with bruising, not black with pooled blood. I’ll be happy when the swelling goes down and it stops hurting. This is what my left thumb now looks like. It’s better, in other words. I peeled away another strip of nail that wasn’t connected the matrix underneath. The bit of pulpy flesh has dried up and shrunk down to that little red scab. Most encouraging of all, skin is slowly growing up the bone and it’s being followed by new nail – it’s the pearly arc slightly left of centre. The yellow discolouration is from the plasters I’ve been sticking over it most days. It’s going to take a good few months before it grows back completely; Wikipedia says fingernails grow at a rate of 3mm a month. About three weeks ago, now, Habiba and I were just coming out of E-Mart, one of Korea’s big supermarkets, loaded down with heavy bags of shopping. We don’t go there that often since we moved, so we stock up when we do. Walking towards the taxis, I suddenly had a strange sensation in my left foot. It was caught on something somehow. Both my hands were full. There was nothing I could do other than try to pull my foot free. So I continued trying to lift my foot – only it wasn’t going upwards, it was going forwards, along with the rest of me. I landed splat on my front, left knee first, finally dropping the bags. My knee had taken quite a blow and it hurt like a very hurty thing. All I could do for a while was hold my leg feeling a combination of anger and embarrassment – kind of like when Peter Griffin scraped his shin. Habiba had turned turned around as soon as she heard the crash. There wasn’t much she could do. Passing Koreans had a gander as they passed; after a while, one man asked in English if we needed help. My patella was intact, but for several days afterwards I had two grazes that remained damp with pus and wouldn’t scab – because I kept putting plasters on. They did scab, and the scabs have subsequently flaked off, leaving a slightly lumpy area of pink skin. The reason I fell was that the loop of one of my boot laces caught on the unused hook on the other boot, bending it somewhat in the process. Whenever I wear those boots now, I make sure to tie them up properly (instead of leaving them loose enough to slip on and off), using the final pair of lace hooks, pulling the hooks closer to the centre of my foot and making the free loops of lace shorter in the process.